This fall my very first audiobook ever came out. In Germany. 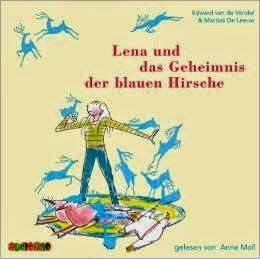 At Audiolino LENA UND DAS GEHEIMNIS DER BLAUEN HIRSCHE was issued. Anne Moll is the actrice who reads the story. It's the German translation of DERTIEN RENNENDE HERTJES (THIRTEEN RUNNING DEER), my book with illustrator Mattias De Leeuw and translator Rolf Erdorf. In the meantime the paper version of the book (published by Gerstenberg) was awarded with the title 'Buch des Monats November 2014' (Book of the Month), by the Institut für Jugendliteratur in Austria! The book can be ordered here and the audiobook here.